Not often do parents and their offspring get chances to spend time together after the young escape the elders' influence. And many times they don't want to. But this is a story about a father and son who did want to spend time together, sharing a road trip as well as an appreciation for a band that has influenced global pop culture for more than half a century: The Beatles. After earning advanced degrees in classical music theory and composition, Aaron Krerowicz (30) turned his analytical ears to pop music. Since 2012, he has worked as a Beatles scholar, lecturing extensively throughout the United States and England and authoring several books. Twice he combined lecture tours with family vacations: to Colorado in 2014 and to Missouri in 2015. Krerowicz (62) was retired. The two traveled through Kentucky, Tennessee, Mississippi, Arkansas, Texas, New Mexico, and Arizona in March 2016, with Aaron delivering programs along the way. 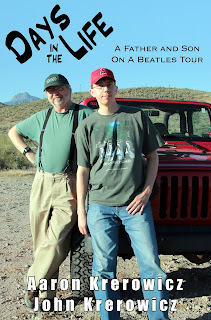 During the trip, Pop and the pop music aficionado kept journals meticulously documenting their travels, and regularly posted their writings on Aaron's Beatles blog. Those blogs, supplemented with additional anecdotes and recollections, form the basis for this book. All of the events and conversations here are real, though some minor details (such as dates and names) have been altered.